Absinthe, called the “green fairy” after its peculiar hue, was banned in the United States back in 1912. Sensational accounts of the highly-alcoholic drink, originally thought to cause hallucinations, grew increasingly common and outlandish. 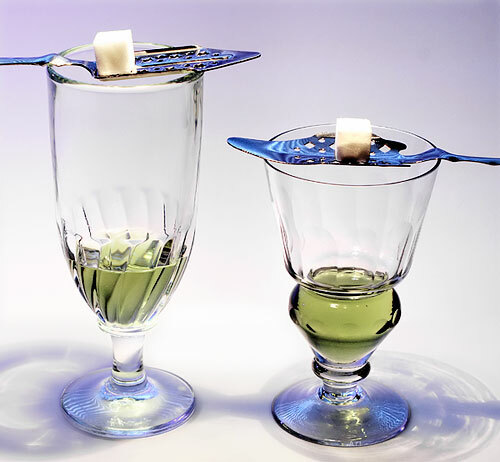 Absinthe became famous for supposedly driving its fans mad, even spurring them to commit murder. But people who drink the sickly-colored spirit generally have the same experience — getting drunk but missing the far-out hallucinations that the drink supposedly ought to deliver. Some unverified, historic accounts of hallucinogenic effects might be explainable by toxic chemicals that were added to enhance absinthe’s coloration, but the drink itself didn’t do anything to them. Rather, these accounts were likely the sensationalist efforts of prohibitionists, or marketing efforts hoping to build up a reputation around absinthe. So much for reports from the likes of Oscar Wilde, claiming that the drink gave them a new clarity. While so-called absinthism is really just alcoholism, there is one particular compound found in absinthe that’s responsible for its toxic reputation. That key ingredient is the oil of an herb called wormwood. Wormwood oil is mostly made up of a chemical called thujone. Thujone, in high enough concentrations, is toxic to animals. Studies on thujone and its toxicology from the 19th century found that the effects of thujone poisoning — auditory hallucinations, seizures and other muscular convulsions — are very different from the common symptoms of alcohol poisoning, which sedates rather than agitates. It was these studies that first gave rise to the idea that absinthe has an effect on its drinkers that is wholly different from other alcoholic drinks. Thujone suppresses a neurotransmitter called GABA, which is responsible for inhibiting activity in the brain. By cancelling out an inhibitor, thujone has a double-negative effect that causes rampant excitation throughout the brain. In extreme enough cases, this mechanism causes the seizures that were observed by 19th-century researchers. But there are some problems with those studies. Aside from the fact that they were conducted on animals and then generalized to humans — the only evidence for absinthism in humans is anecdotal at best — the experiments compared the effects of alcohol injections with comparable dosages of wormwood extract. Some trials involved the injection of up to five grams of either chemical. While an average drink holds 12 to 14 grams of alcohol, the five-gram dosage administered in the studies was more than enough to draw a severe reaction from the dogs used in those studies. So yes, if you consume just as much thujone as you do alcohol, then you’ll suffer some unfortunate symptoms, like convulsions and sleeplessness, that bear no semblance to the alcohol poisoning with which any heavy drinker is likely familiar. But absinthe can be up to 150 proof — that means it’s about 75 percent alcohol. Meanwhile, even pure wormwood oil will only be about 40 percent thujone, meaning the percentage found in the absinthe is even lower. The most thujone-dense absinthes will still only contain about 35 milligrams. If someone wanted to drink absinthe to experience thujone’s excitatory effects, they would have to drink an absurd amount of the stuff. The recommended 20-cup limit for thujone consumption is well beyond what could feasibly be consumed. To reach that point, the sheer amount of alcohol found in absinthe would have killed even the hardiest of drinkers several times over. So while thujone is a toxin, the real danger in absinthe comes from the alcohol. ..absinthe be so very good… leo likey a lot.